The next time you encounter a sanitation or recycling truck on the road, Slow Down to Get Around. Gov. Andrew Cuomo recently signed into law legislation (S.426B-Marcellino/A.7763B- DenDekker) to add sanitation and recycling vehicles to the state’s “Move Over” law. Both legislative houses approved the bill in late June. Under the new law, motorists must move over and slow down to an appropriate speed when passing refuse trucks, giving the same treatment as vehicles with flashing red/ blue or amber lights that were already covered under the law. CSEA and our allies, including other waste industry organizations, lobbied strongly in favor of this legislation. “This legislation is a big step toward minimizing the potential hazards that sanitation workers face on the job,” CSEA President Danny Donohue said. “Sanitation workers provide a crucial public service for our communities, and this law will finally provide them with the same protections afforded to other important public servants. However, we have much more work to do to ensure that everyone is safe. 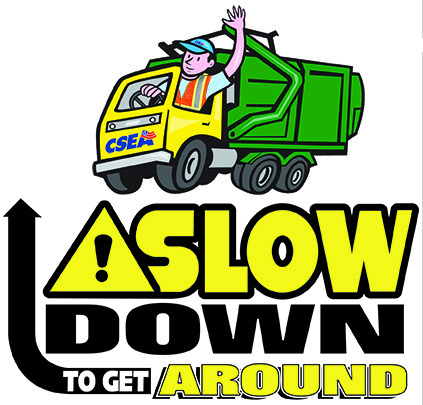 Along with passing legislation such as this law, CSEA had launched our “Slow Down to Get Around” campaign to boost potential hazard awareness for those employed in sanitation, increase public awareness of the dangers that face sanitation workers and increase the state Public Employee Safety and Health (PESH) Bureau’s enforcement of sanitation standards. Sanitation is among the most dangerous work that public employees perform. The U.S. Bureau of Labor Statistics reported that in 2014, the latest year statistics were available, sanitation workers had a fatality rate of 33 per 100,000 workers, the fifth most fatal occupation that year. Closer to home, three CSEA members have lost their lives since 2013 while performing sanitation work. We will Never Quit this fight until everyone can go to work — and go home — safely.